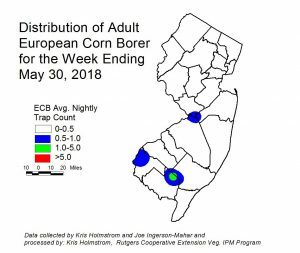 Increasing numbers of European corn borer (ECB) moths have been captured this past week, but still relatively few moths overall. At present, the highest activity is on the Cumberland-Atlantic border, with minor concentrations in Salem and northern Burlington counties (see ECB map). As early sweet corn plantings progress through whorl and pre-tassel stages, feeding from this pest may be detectable. Look for the characteristic “shot-hole” type of feeding (photo at right) and consider treating when infested plants exceed 12% in a 50 plant sample. A few corn earworm (CEW) moths were captured in blacklight traps this past week. These numbers are quite low, and do not pose any threat to sweet corn not yet in the silk stage. 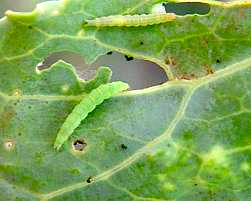 Low, but increasing levels of imported cabbageworm (ICW- photo at upper left) and diamondback moth larvae (DBM – photo at lower left) have been found in cole crop plantings in central and northern NJ this week. These infestations will increase rapidly as the spring season progresses. Check 5 consecutive plants each in 10 random locations throughout the planting, paying particular attention to the innermost leaves where ICW often feed. Consider treating if caterpillars are found on 10% or more plants that are in the 0-9 true leaf stage. 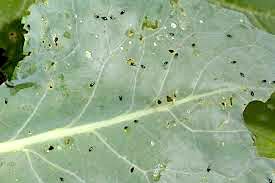 From 9-leaf to the early head stage (in broccoli, cauliflower, and cabbage) infestations up to 20% may be tolerated. Once heads begin to form, a 5% threshold should be observed to protect the marketable portion of the plant. For leafy greens such as collards and kale, 10% plants infested is the threshold throughout. 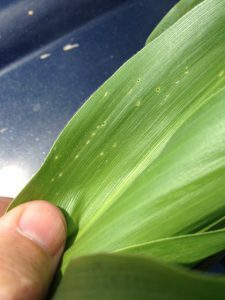 No new egg/feeding scars of allium leaf miner (ALM) occurred this past week at the plot at Snyder Research Farm in Hunterdon County. No adults have been captured for the past 3 weeks. 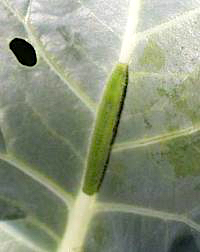 Mines are extensive and obvious on infested plants, indicating that the larvae have attained some size. Those that were observed directly were approximately 1/8″ in length. All signs point to this first flight being over. 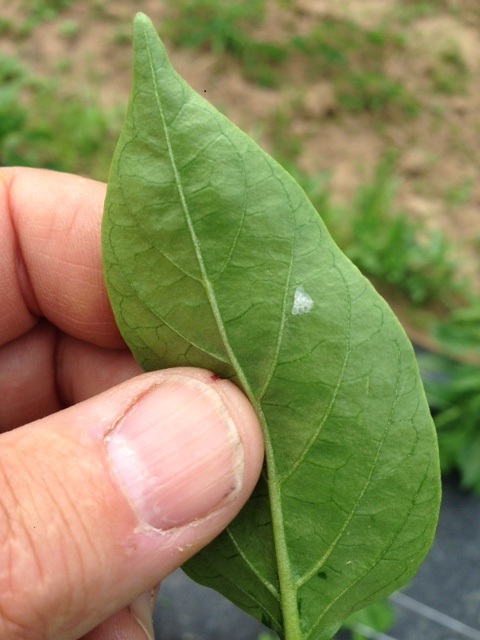 With ECB moth activity increasing, growers should be looking for ECB egg masses (see photo at left) on the underside of pepper leaves. The larvae that hatch from these eggs will bore into the central stem of pepper plants in the absence of suitable fruit. This damage causes the tops of the plant to die, and eliminating the crown set of fruit in the process. Check 2 leaves per plant on 5 consecutive plants in 10 random locations. Consider treating if 2 or more leaves are found to have ECB larvae on the lower surface. Field scouting of outdoor and high tunnel tomatoes has begun. Bacterial leaf spot infections (see photo at left) have begun to appear in some fields following heavy rains. Look for very dark lesions on leaf margins, and on the interior of immature leaves. Lesions will have chlorotic borders and may cause immature leaves not to expand properly. 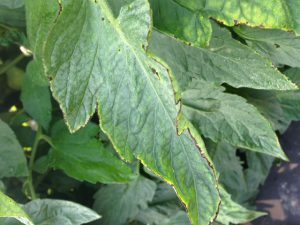 Growers should treat preventively for this disease prior to symptoms. See the tomato section of the 2018 Commercial Vegetable Recommendations Guide for materials and spray schedules. There was an increase in BMSB catches in black light traps in southern NJ this past week (see BMSB map at left). Although this pest has not had serious impact on vegetable crops like peppers in recent years, it is still a significant pest of tree fruits. These numbers are not especially high, but are significantly higher than last week.